GMLG's London plant delivered 15 GT36CU-MP's October to November 1992. ZR 01-611 and 01-612 GMLG GT36CU-MP 3500 hp at London Ontario GM plant November 16 1992 by Don McQueen. Formerly Nchanga Consolidated Copper Mines. Also has GA8's 8-12, GA18 10, G18U's 21-23 and G18U's 24-25. 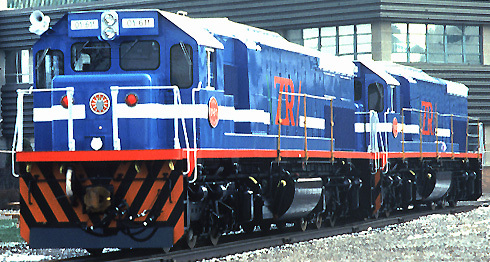 NCCM 7 EMD G16 Co-Co 1800hp. 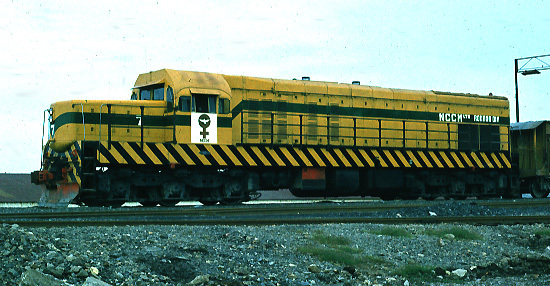 This is the original G16 demonstrator (nose chopped and dynamic brake removed at EMD) taken January 30 1982 by Peter Bagshawe. Still under construction, please check back.